Kids will appreciate attractions like Sea World Theme Park and Dreamworld. Explore Gold Coast's surroundings by going to Glow Worm Caves (in North Tamborine), Cape Byron Lighthouse (in Byron Bay) and Dicky Beach (in Caloundra). And it doesn't end there: find something for the whole family at Warner Bros. Movie World, identify plant and animal life at Burleigh Head National Park, meet the residents at Currumbin Wildlife Sanctuary, and stroll through Coolangatta Beach. To see more things to do, ratings, where to stay, and other tourist information, read our Gold Coast visit planning site . Sydney to Gold Coast is an approximately 3.5-hour flight. You can also do a combination of flight and train; or drive. 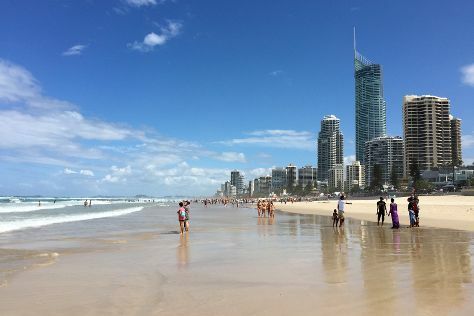 In November in Gold Coast, expect temperatures between 30°C during the day and 20°C at night. Wrap up your sightseeing on the 27th (Tue) early enough to travel to Hamilton Island. Bring the kids along to Scuba & Snorkeling and Catseye Beach. For other places to visit, maps, ratings, and tourist information, read Hamilton Island road trip site . Getting from Gold Coast to Hamilton Island by combination of train and flight takes about 5 hours. Other options: do a combination of train, bus, and ferry; or do a combination of bus and ferry. Traveling from Gold Coast in November, Hamilton Island is a bit warmer at night with lows of 26°C. Cap off your sightseeing on the 30th (Fri) early enough to travel back home.